Werner von Wallenrod's Humble, Little Hip-Hop Blog: Let's Get 2 Deep, Part 2: Did Thomas On Time Just Diss the Juice Crew? Let's Get 2 Deep, Part 2: Did Thomas On Time Just Diss the Juice Crew? ...Continuing on from Part 1, there's a lot of key info I didn't even get to you about 2 Deep. The first big thing is that they were on Cold Chillin' Records. Throughout the 1980's, Cold Chillin' meant one thing: Juice Crew. From the very beginning, every single record released on Cold Chillin' Warner Bros (and there was a lot) were from members of The Juice Crew. Seeing the Cold Chillin' label on an album's spine was the same as seeing the Juice Crew Allstar logo once you opened it up. And 1990 was the first year they strayed at all from that, with two artists outside that family: Grand Daddy IU and 2 Deep. And those two acts were barely outside the Crew. IU was being produced and managed by Biz Markie and Cool V. Honestly, the reason I sprang for 2 Deep's album after copping their "Homework" single based on the video was seeing that Cold Chillin' logo in the stores; it meant "must have." These guys had to be some kind of Juice Crew affiliates! And what was 2 Deep's connection? That leads us to the other major point I left out of Part 1... who was the other half of 2 Deep? Jae Supreme was pretty much the lead and only MC, and based on his later career, clearly played a major role in the production. And the guy doing all the dope scratching seemed to by that DJ K-Slim dude (2 Deep's liner notes really sucked in terms of giving proper credit). But there's obviously two guys on all the album covers and in their video. So who's the other half of 2 Deep? 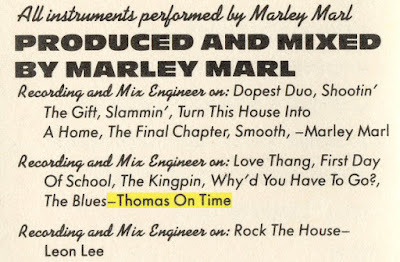 Thomas On Time. If that name rings any bells, it means you were a rap nerd like me reading all the credits in your rap tapes. He came up a bunch in early Juice Crew projects, seemingly in a largely technical capacity. You'll see him listed as an engineer or mixer, and his name stood out, because he had a nickname. Here, for example, check out the credits to Craig G's first album, where he's featured quite prominently. ...Okay, not as prominently as Marley Marl. But still, you can see he seems to have been a pretty big player on that album. And he worked on a bunch of Juice Crew/ Cold Chillin' projects. So, I assume that's why 2 Deep got an album. He put in his time behind the scene, spent years working on their projects and they finally decided to give him and his partner a shot to shine for themselves. They probably also pressured them into doing a school about "Homework" they could market to the kids. But like I said, that was the only Kid 'N' Play-type song they had. The rest of the album was more traditional, going for a pretty smooth type of vibe over all. They had a couple house songs, because of course they did, and yes, the token whispery love ballad with a rather underwhelmingly sung hook. One song had guest production by Larry Smith, but otherwise 2 Deep produced everything, usually together, but each had one solo effort, too. It's got a lot of familiar samples other hip-hop artists had already used - plenty of James Brown staples - but always with a unique little spin to it, and a very polished, professional sound. They might not have been pushing the envelope, but these guys knew how to make a quality record. And yeah, Jae was really the front man, who did all the rapping. Just cold cash to gain. So when you hear my name? Thomas, p.k.a. I'm the T.O.T. For all those who dissed me!" "Run! Run and hide, you dirty maggot! These nineties I'm claimin' - watch me bag it. Put me down those times I begged for support? Now excuse me, hold that thought. Cut me from the crowd you ran like a sharp knife. Wouldn't let me touch your set. Things you did just made my pride stronger." Now you're low in health, poor in wealth. Never thought I would succeed - the last one picked. Was to mentally destroy this man. And you're a fucked up man with how many kids?" Okay, he's definitely talking about somebody, right? This isn't just a general record for all the people who didn't think he'd become somebody, this is aimed at somebody. But who? Unfortunately, there aren't enough clues for me to quite figure it out. But there are a few specific lines, so maybe if we all put our heads together in the comments we can figure this out. You'll be in debt for life thinking crime pays. So stand up tall and be brave. The one that shot ya." And your crab-like No Juice Crew!" He's going at The Juice Crew! Or at least somebody from it. Marley? Maybe a rapper like MC Shan? Or someone more on the business end, like Fly Ty or Lenny Fischelberg? I don't see why he'd be going after Cold Chillin', though, when they just put him on and gave 2 Deep their album. I could see them coming out later and having beef with those guys, but not right in the middle of their album. The stuff about not letting him touch his set and going broke sounds more like an artist than a label executive, anyway. But this album shouts out the Juice Crew artists (and the Cold Chillin' staff) in their liner notes, and I couldn't spot any conspicuous absences. Jae even name-drops most of them at the end of "Rain Dance." In fact, this song ends with shout outs, and T.O.T. doesn't name any Juice Crew guys, but he does shout out Lenny and Ty, so they have to be in the clear. There is one line, though, in the shout-outs that aren't included in the printed lyrics: "A lot of people in Queensbridge... there's also a lot of people out there who did diss me, but I said I wanna give thanks to those who didn't." So it's someone from Queens? I mean, again, it's possible he's thinking of different people who dissed him during different parts of the song. It's even possible that he meant that Juice Crew line to be like, "we're down with the Juice Crew; you're in the No Juice Crew," which would be corny as Hell, but possible. Maybe it is all just referencing a hypothetical nonbeliever. It's just that some of those lines sound really pointed, like he's zeroing in on some specific guy... who sired a lot of kids. 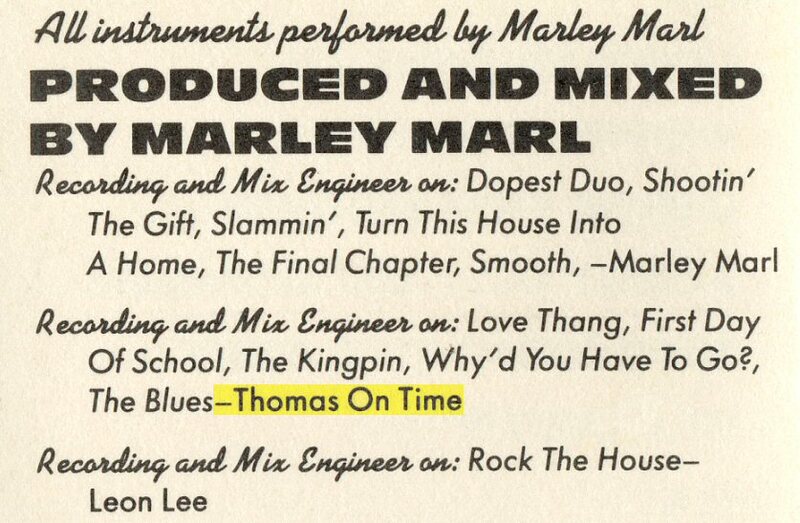 And him burning bridges here would explain why Thomas On Time never seemed to appear in any liner notes after this. Somebody must know the answer to this mystery! 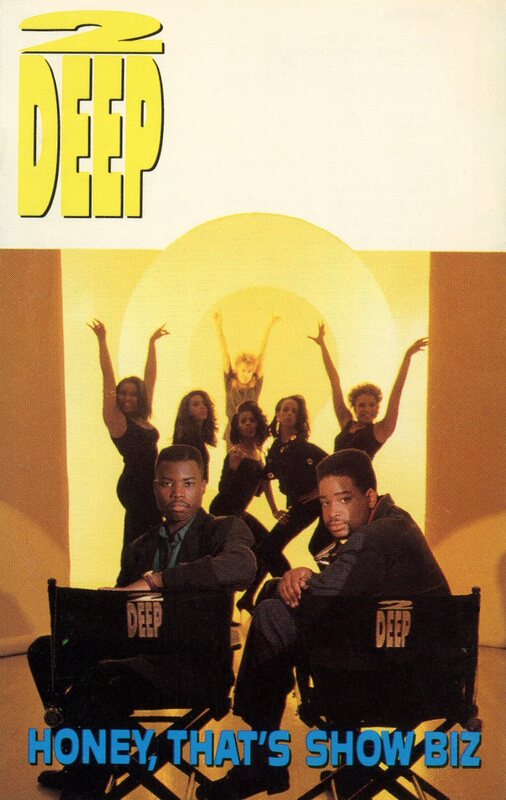 2 Deep had one more single off of this album (the love song... god knows whose decision that was), and that's the last time I've seen his name anywhere. As we know, Jae Supreme moved on to other things. I kinda feel bad for T.O.T. There's no lost masterpiece here, but even in 2018, Honey, That's Show Biz is still pretty listenable.